The first half of the movie spends an extensive amount of time on showing Drizzle settling into her new life as a cloth merchant and her slowly growing affection for a charming messenger and courier whose eye she had cought. There is not a lot of action here, which might be a bit disappointing for people who are really mostly looking for movies with lots of of stunts and swordfights. I did quite like this part of the story, though, and think it’s quite well done. And of course, this wouldn’t be a wuxia movie if her new happiness were going to last. During a bank robbery she is forced to use her kung fu skills to take out a large band of robbers and it doesn’t take long for not only the Black Stones to pick up her trail again, but also the other secret societies to send their own people on the hunt for the body. 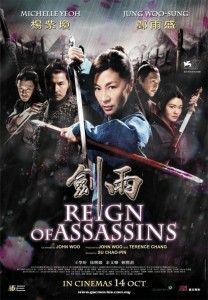 Like most wuxia movies, Reign of Assassins is not a massive budget production. $14 million is not even enough to pay the catering for the last Hobbit movie. But the sets and costumes are looking just as fine, if not even better, and the visual quality and stunts are very well done. It’s very obviously not an AAA-movie, but certainly not a B-movie by any measure either. I very much enjoyed all the cast and liked all the acting and character writing. None of the characters are boring, overly cliched, or inappropriately overacted, even though a lot of them are quite excentric. The newest recruit of the Black Stones, a young woman who murdered her husband and two other people on her wedding night is obviously batshit insane, the wizard always dresses in a rainbow colored silk cape, and the noodle-maker tries to be incredibly cool at everything he does, but I think they are all acted much better than most of what you get to see in Star Wars or The Hobbit. The plot manages a great balance of being predictable and having plenty of unexpected turns. 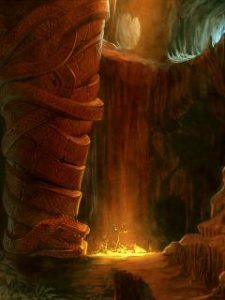 Often I knew that something was up with one character or another, but couldn’t really say what exactly it would be when it came to be revealed. Reviews for the movie seem to be “generally positive”, which is an assesment I would agree with. This is not a movie that makes you want to tell all your friends about or get the DVD for your own collection if you saw it at someone elses place. But the movie does a lot of things very well while at the same time not doing anything actually bad. If I absolutely had to make some negative comments, I might say that in the first five minutes there is perhaps a bit much jumping back and forth between scenes as the backstory is told, but it’s not really something that hurts the movie in the long run. So yay or nay? This is a good movie. 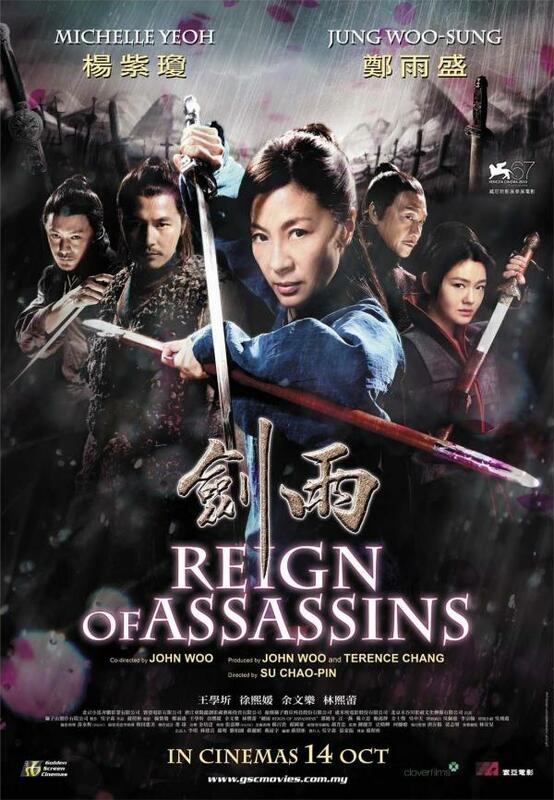 Perhaps not an outstanding movie that everyone should watch, but if you’re looking for a decent wuxia movie you havn’t seen yet, Reign of Assassins is one I can definitly recommend And probably would place quite high on my list.